I recently had the opportunity to go out to a couple different types of cold-in-place recycling (CIR) jobs. The first job was using the emulsion process that I spoke about here. The second job was an eye opener for me in terms of cold-in-place recycling because it was a very different process than the emulsion process that I had learned about previously. FMG (Fonseca/McElroy Grinding) out of San Jose, CA runs a recycling train that uses a foamed asphalt to create a recycled road surface instead of emulsifiers. As the first step, a layer of cement is laid down on the surface of the roadway. As the train moves along the roadway it grinds up the roadway, picking up the cement along with it. A traditional milling drum rotates upwards which can cause slabs and the need for additional crushing in the recycling process. FMG's milling drum rotates in the downward direction which gives them more control over the size of material that is produced. Once the road is ground, the foamed binder is added to the material. The foamed binder is created by injecting water and air into the asphalt bitumen. The foamed asphalt, and any additional water necessary to achieve the optimum moisture of the mixture are mixed with the grindings and then laid down on the roadway to be compacted with rollers. 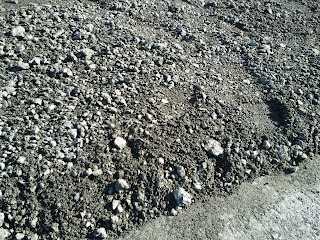 The mix design for this type of asphalt is created by taking samples at various locations on the roadway before CIR Work. These samples are taken by a small grinder and processed into a product to duplicate the aggregate material produced by the milling machine. The laboratory has a special foaming machine that can duplicate the foaming bitumen process that the recycling machine has in the field and the foamed bitumen is added to the aggregate material by mixing just like in the field. This type of mix design is not done using the HVEEM or Superpave method but uses the tensile strength test, similar to the Marshall method. With emulsified cold-in-place recycling the material initially comes out of the recycling machine looking like brand new HMA from a traditional hot plant (albeit brown at first). 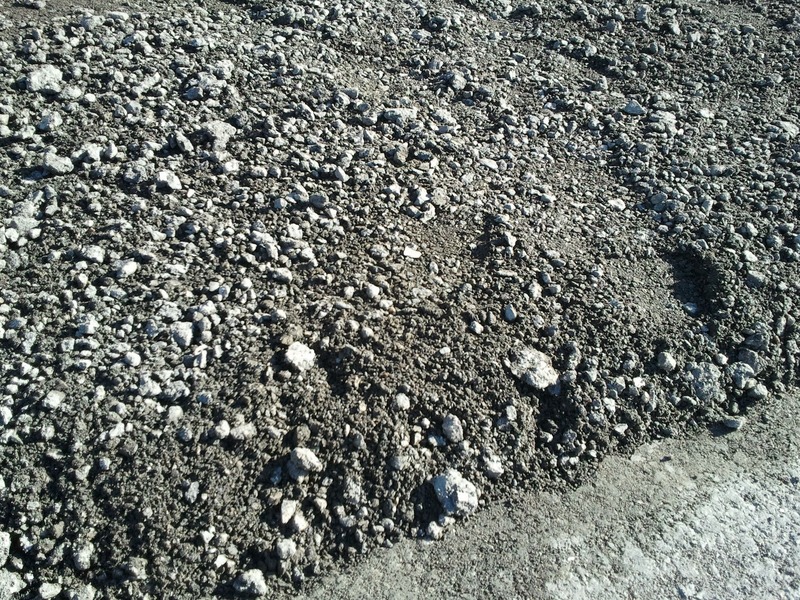 With the foamed asphalt cold-in-place recycling the material looks more like a recycled base rock as you can see in the photo below. The reason behind this difference in initial appearance is that with emulsified cold-in-place asphalt, the binder coats the rocks. With foamed bitumen cold-in-place asphalt, the binder forms a sort of web which does not completely coat the rock but still holds the particles together. After being laid down, the material is subjected to 3-4 steel drum rollers and a rubber tire roller. 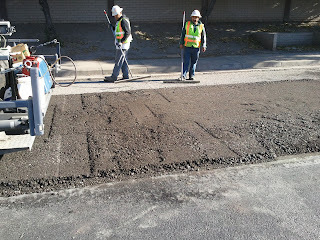 After compaction, the roadway looks very much like a roadway made from traditional HMA and is traditionally fog sealed for extra protection from the elements. Currently it is customary for these types of roadways to be overlaid with a traditional HMA or another type of wear course within 3 days but traffic is put back on the road at the end of the shift or even earlier. The entire process was extremely humbling to watch and impressive to say the least. This type of train is much shorter than the train I mentioned in my last post and does not have the same issues of having difficulty turning around or taking curves in the roadway. This type of recycling seems to be a good, low cost replacement for a full depth or multi-layer paving project. 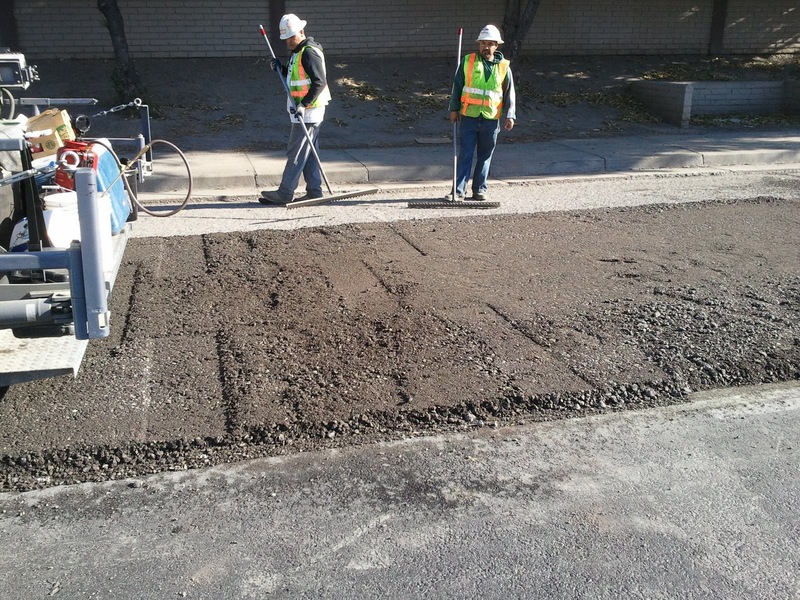 Unlike the emulsified recycled asphalt pavements, an overlay is typically recommended within 3 days of paving with a foamed bitumen cold-in-place recycled pavement layer. It will create a very stable and cohesive sub-layer to an overlay but is not typically recommended as the surface layer since the elements can cause it to ravel. In addition, this type of paving, like the emulsified cold-in-place recycling process is not recommended for roads with subbase failure. 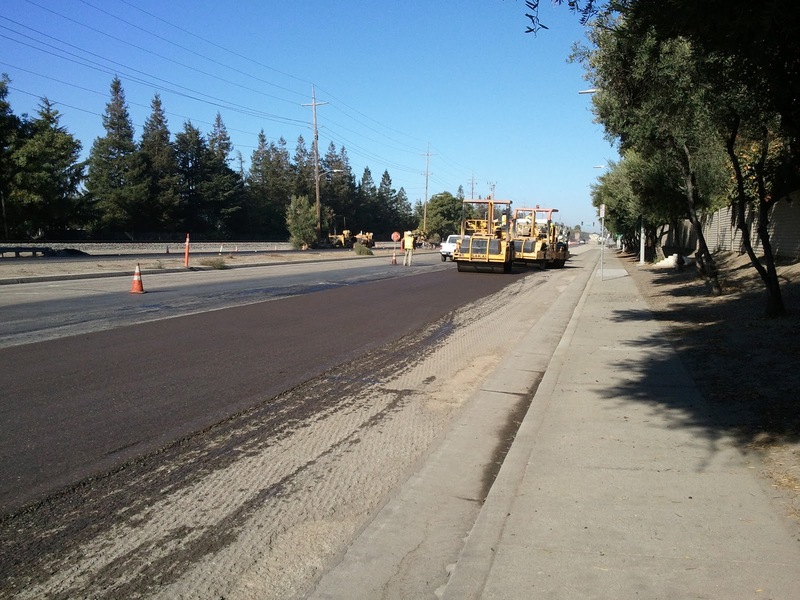 This process works best for roads with surface pavement problems. With that said, as I mentioned before I can definitely see cold-in-place recycling as the next big thing in California. Both the emulsified and foamed bitumen cold-in-place recycling processes are great options for cities and counties who have tight budgets, high traffic areas, and/or a desire to reduce pollution by reducing fumes and trucking. Take a look into it the next time you're bidding a job, you might be surprised at the money you can save! Win the 2010 Caltrans Standard Specs!